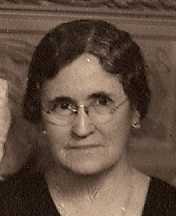 Mary Agnes Russell was born on 16 September 1871 at Leonardtown, St. Mary's County, Maryland. She was the daughter of Ignatius Francis Russell and Adrianna Maryman. Mary Agnes Russell married Ignatius Simms Spalding, son of Felix French Spalding and Regina Harriet Simms, on 27 November 1895 at Washington, District of Columbia.1 As of 27 November 1895,her married name was Mary Agnes Mary Spalding. Mary Agnes Russell married Thomas Jefferson Spalding, son of Felix French Spalding and Regina Harriet Simms, on 22 April 1908 at Washington, District of Columbia. Mary Agnes Russell died on 21 April 1945 at Washington, District of Columbia, at age 73. She was buried in April 1945 at Mount Olivet Cemetery, 1300 Bladensburg Road NE, Washington, District of Columbia. [S268] District of Columbia Marriages, 1830-1921.